The thorny issue of all-age worship and how to do it leaves many churches in a quandary. Some take the easy option and forget all about it because it causes too much hassle, while others deliberately make their services unappealing to anyone who either is a noisy kid or is old enough to bring a noisy kid with them.Tim Storey has trodden the narrow path and has come up with some excellent strategies for ensuring that all-age worship is just that - an enriching time that provides the right atmosphere for people of all ages to come together and concentrate on worshipping God. All Age Worship by Tim Storey is published by Kevin Mayhew and is our 36226th best seller. The ISBN for All Age Worship is 9781844174782. This small booklet is a wonderful little help to avoiding all-age Worship services being the Warship that sank the Church! There is nothing more miserable than badly done all-age worship and nothing as likely to cause dissent between the generations as all age worship, and this little book provides some wonderful guidance through this minefield, yet it does it in a friendly communicative style that will make you smile instead of sigh. Good clear suggestions throughout. An essential for the Church Leaders whether already involved in all-age worship or thinking of it. Got a question? No problem! Just click here to ask us about All Age Worship. 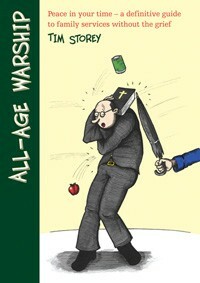 Is this a resource guide, or does it deal with the issues involved in leading all-age worship? A:Tim Storey's book addresses the particular issues in preparing all-age services, rather than being a resource book per se; some passages and quotes are included, but it is produced primarily as a worship leader's introduction to this topic.